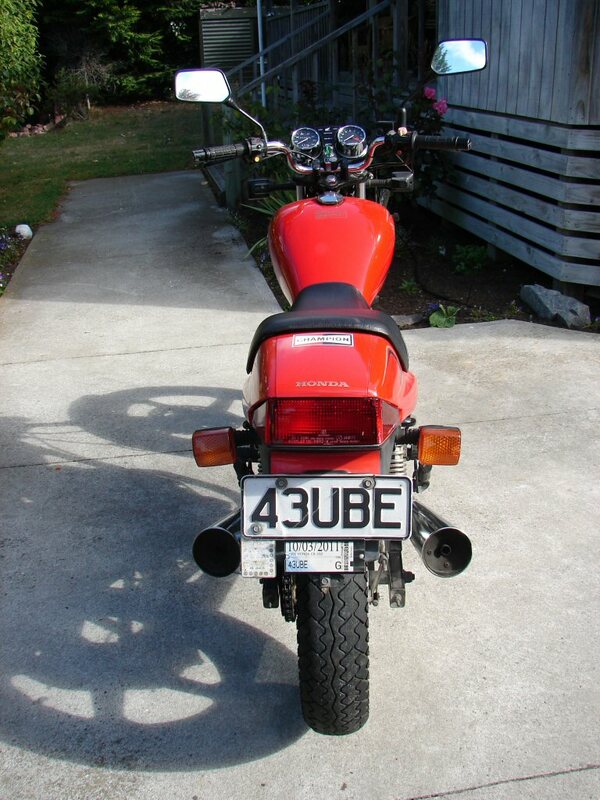 Sue was keen to learn to ride, so we found a suitable bike on Trademe. I was not enamoured of small capacity singles, so a twin was the answer. I found a 250 Honda and we checked it out. The owner had bought a new battery because it had starting problems. The new battery did not solve the problem so it was advertised as having a faulty starter. When we went to check it out the owner fired it up by connecting it to a car battery with jumper leads. While I was test riding it I was thinking that the starter must be ok as it had just started the bike. We decided it was worth a punt and Sue bought it for two grand. 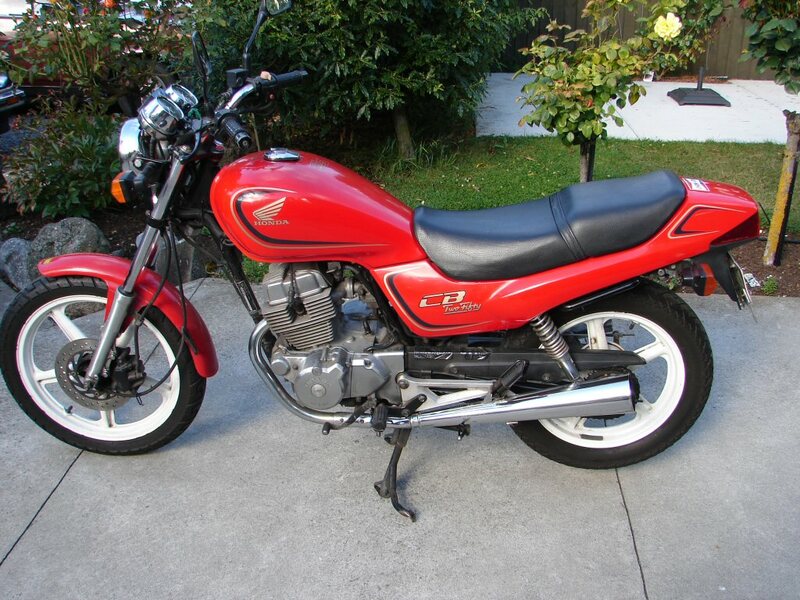 Learner bikes command a premium price. Despite all of that, it was kinda pretty.. I straightened all the levers and pegs, and adjusted everything I could to make it a compliant machine. I tested the "new" battery and found it to be faulty, so I fitted another new battery which cured the starter problems. Sue was heavily involved in doing a social work degree, and that was enormously time-consuming, so her learning progress was slow. 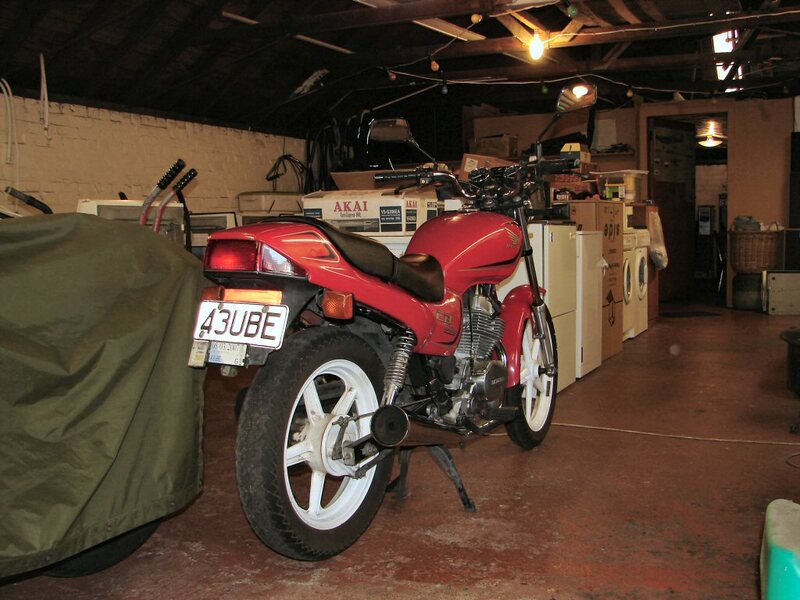 However we had a nearby good friend who was also learning to ride, and she borrowed the Honda quite often so it did get a fair amount utilisation. In 2010 the BSA International Rally came to town, and as a result I decided to ride around America with friends and to attend the 2014 Rally which was to be held in California. This now put pressure on the learners to become proficient enough to undertake such a tour that might involve 10,000 miles and fairly high speeds from time to time. I was of the opinion that if you could not happily travel at 80mph only a few feet away from a huge truck then you should not consider doing so. Problem was - there was nowhere that anyone could legally practice such behaviour in this country. Nor did I think that this little fellow would be able to explore the upper reaches of it's own speedo.. In February 2011 a huge earthquake devastated our city, and the worst hit area was the small port town that we lived in. What then followed was a 6 month period of total mayhem and thousands of severe aftershocks, so bikes were lashed to supports to prevent them falling over, and learner riding was for some time an unacceptable risk factor. 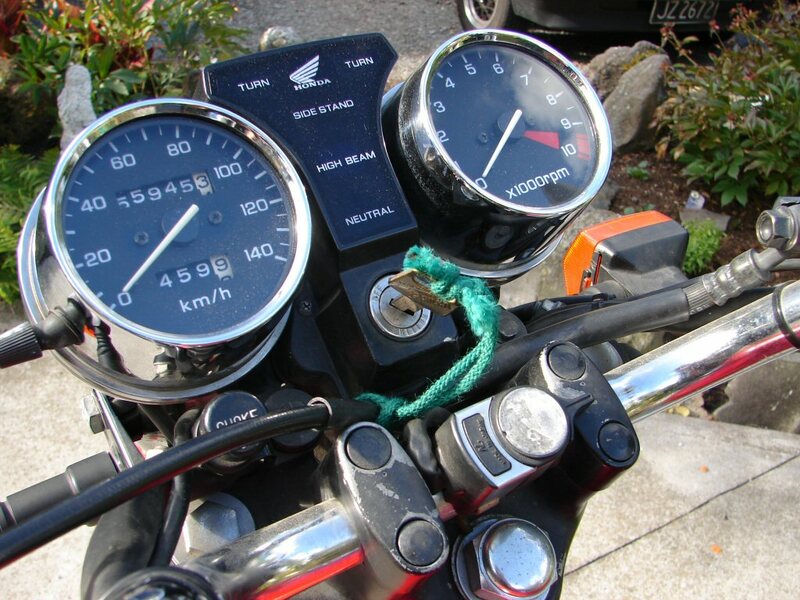 While academic studies continued, learner-riding was discontinued. Meanwhile our friend got her restricted licence and was able to proceed with advanced riding albeit on "LAMS" approved machines. It seemed she would definitely be riding in America. Time sped by and it was obvious that Sue would not get the time to master motorcycling before America and would be instead a happy pillion. I cleaned the Honda up and took these photos for the sale ads. I still view the body styling as being a plagiarised version of the Triumph Hurricane. 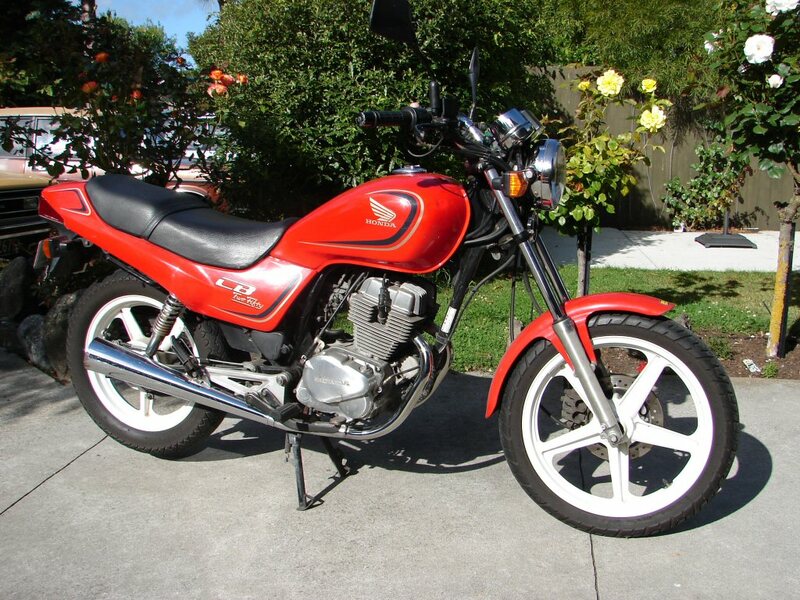 Apart from having to repair the damage from seemingly numerous previous "learner" riders, the Honda proved totally reliable, required no parts and performed extremely well during 5 years of ownership. It had managed 120Kph uphill on the tunnel road during the delivery trip on the day we bought it, and with a heavy rider in the form of myself. New found respect.! A very vice free little bike.